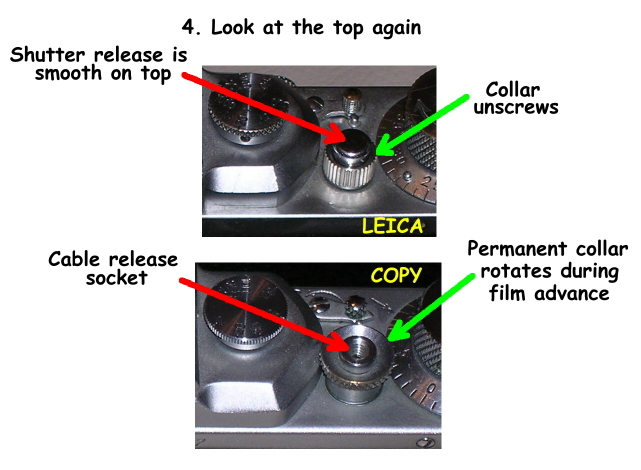 Let's face it ... there are a WHOLE lot of fake screwmount Leicas out there. Often they come with a garish polished brass finish, sometimes even with wood veneer in place of the leatherette, and gold-inlaid Nazi eagles that would have made Goering blush, and they're easy to spot. 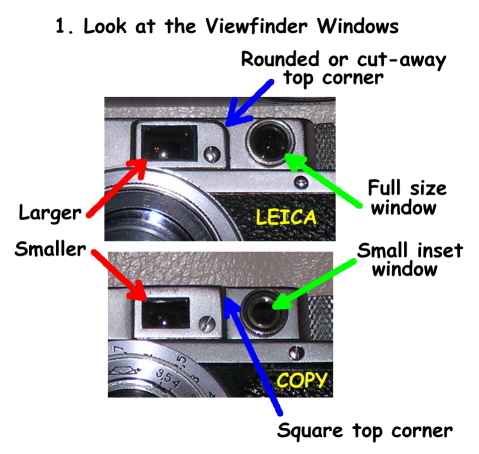 But somehow people still occasionally get taken in and buy a counterfeit thinking they have a real Leica. 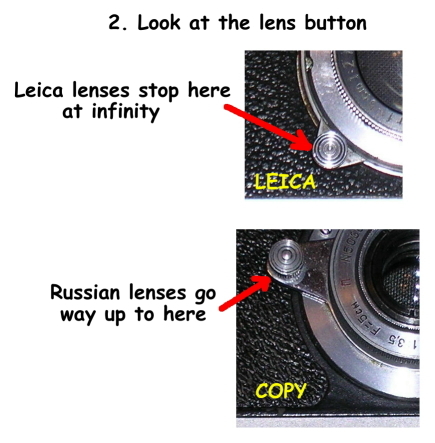 Counterfeit Leicas are almost always made from Russian FEDs and Zorkis, which were copies of the Leica II. Often the engraving is quite good, the serial numbers are correct for the type, and although bizarre finishes are common, it's not impossible for a fake to have a realistic finish. 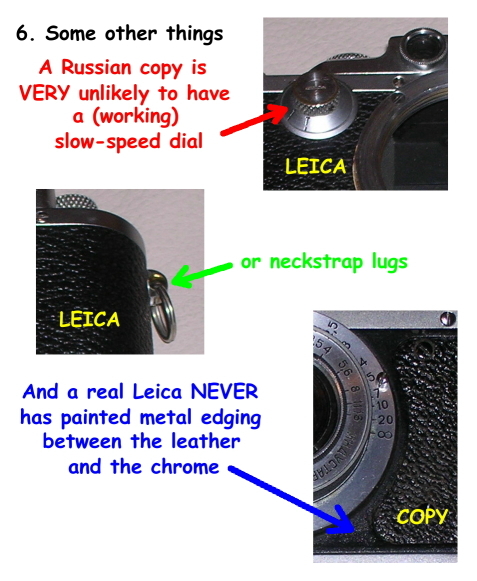 Some details are easy for the counterfeiter to duplicate on the Russian camera, and some are more difficult... and part of the deal is not to have to invest more money into the fake than you can get out of it, so the hard stuff is usually not done. 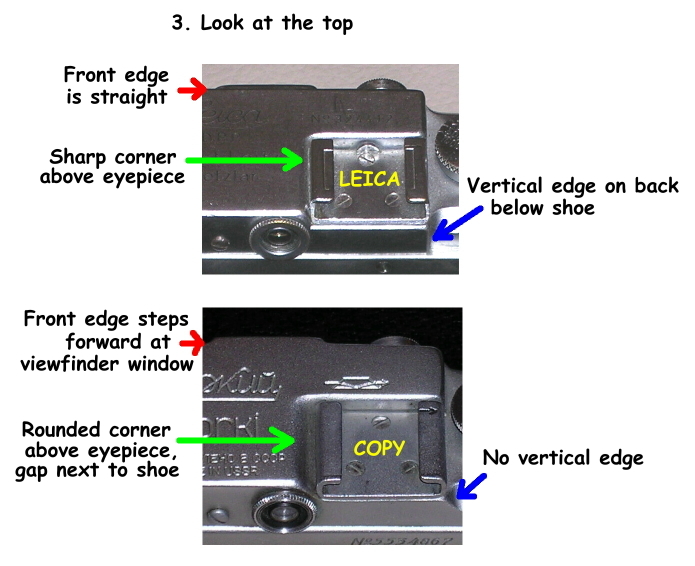 In the images below, I have pointed out some of the differences between real and counterfeit Leicas that are relatively difficult for the fakers to correct. They may get one or two of these details but they won't often get them all. 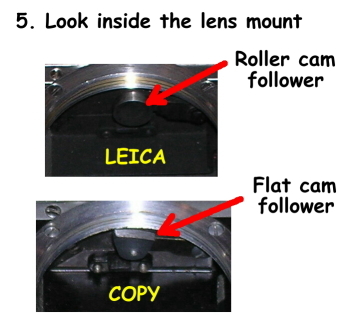 So: How do you spot a fake Leica?